Connor Cochran of Conlan Press recieved a check from me shortly after January 10th, 2009, and in return, I was supposed to recieve a Deluxe Last Unicorn hardcover. 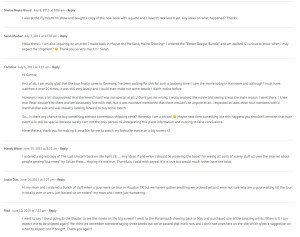 After many years and explanations given for delays (and much patience on my part), I have still recieved nothing, as have countless other fans. I requested a refund by email in 2011 but was ignored. File a complaint with the Attorney General. Document abuse at Ripoff Report. I am writing because during the Arlington, MA showing in May I ordered a couple of books and a print. I haven’t received any information and answer of an email I sent a week ago. I understand Peter’s health situation but the lack of communication is not good. At this rate I am not even happy with my order since it has been such a long time. Please advice. I have a question, my husband Thomas Gensamer and I went to the show in SJ. We had ordered a singed copy of the DVD and a Lady Amalthea HD photo. They said it would come to us within 10-12 weeks. This was about 13 or 14 weeks ago now, should we be worried? 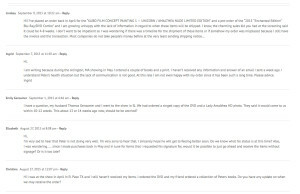 I’m very sad to hear that Peter is not doing very well… Also, I was wondering….. since I made purchases back in May and in June for items that i requested his signature for, would it be possible to just go ahead and receive the items without signage? Or is it too late? Hi I was at the show in April in El Paso TX and I still haven’t received my items. I ordered the DVD and my friend ordered a collection of Peters books. Do you have any update on when we may receive the order? I may have been unsubscribed from the emails. Can you add me back in? I also ordered a signed copy of a dvd maybe last year? – I seriously don’t remember when it was, but it was an advance order- was going to be sent out whenever they were ready. Are there any updates on those? Hey, I ordered some books when you guys came to Austin but they still haven’t arrived and I haven’t received any emails about them. 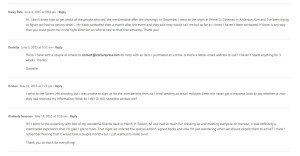 I tried emailing the contact@conlanpress.com but I haven’t never got a reply. Hi, I pre-ordered a signed copy of the new edition Last Unicorn DVD back in June and haven’t received it, nor any word of when those might ship. Any news on when we might expect to see those start to send out? Also, I’ve never received confirmation of having been added to the tour e-mail list, even though I signed up at a screening in Maine in May and have sent them one or two e-mails asking. Can you please add me? kendalls_hat@yahoo.com. I was at the screening earlier this year at the Alamo Drafthouse in Dallas, TX. I ordered one of the really nice expensive prints, but have yet to receive it. Is there an ETA on when I should be getting this? I just wanted to ask if all of the Canadian shipping issues had been worked out? We had ordered a print at the show and haven’t heard anything yet on if and when it will be coming. We paid cash for everything. Hello, I was at the show in April and have not received any word on the status of items that I ordered. I see that there’s some issues with Conlan Press moving now that I’m here but I would like to request to be added to the tour membership. I used the proper email link at Conlan Press when I realized I forgot to sign up, but never got a reply and in the comments it seems the email system didn’t really work to begin with, so, I’m not on the list could you please at freyth [at] yahoo.com to the tour membership? I am also inquiring on an order I made back in May at the Portland, Maine Showing~ I ordered the “Better-Beagle-Bundle” and am excited & curious to know when I may expect the shipment? Hi Connor, first of all, I am really glad that the tour finally came to Germany… However, I was a bit disappointed that the “event” itself was not special at all :/ …I knew that Peter wouldn’t be there and am absolutely fine with that, but it was nowhere mentioned that there wouldn’t be anyone at all… Honestly, I am a bit sad. Maybe next time something like this happens you shouldn’t mention that each event will still be special because surely I am not the only person misinterpreting this piece information and running to false conclusions. I ordered a signed copy of The Last Unicorn back on like April 28….. Any ideas if and when I should be receiving the book? I’m seeing all sorts of scarey stuff all over the internet about people getting “scammed” by Collan Press… Hoping it’s not true. Thankfully I paid with paypal if it is true but would much rather have the book. 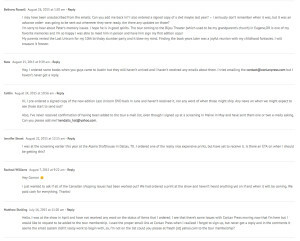 Hi my mom and i ordered a bunch of stuff when u guys were on tour in Houston TX but we havent gotten anything we ordered yet and were not sure why are u guys waiting till the tour is totally over or are u just backed up on orders? I want to say I loved going to the theater to see the movie on the big screen! I went to the Portsmouth showing back in May and purchased one of the amazing prints. When is it I can expect this to be shipped again? We think we remember someone saying three weeks but we’ve passed that mark now and I don’t see anywhere on the site which gives a suggestion on when to expect one if bought. Hi, I don’t know how to get ahold of the people who sell the merchendise after the showings. 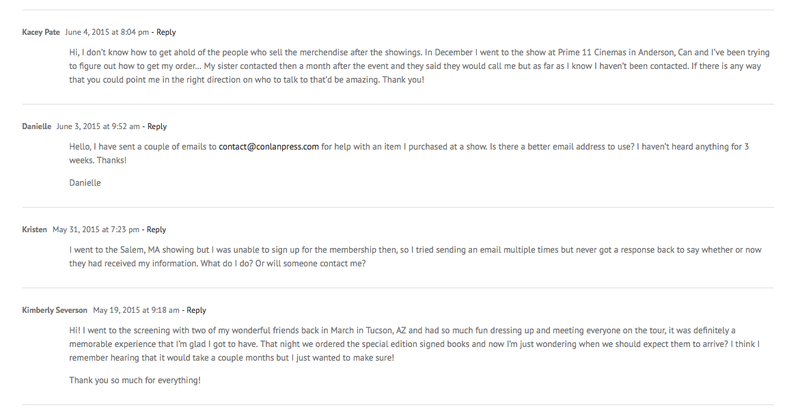 In December I went to the show at Prime 11 Cinemas in Anderson, Can and I’ve been trying to figure out how to get my order… My sister contacted then a month after the event and they said they would call me but as far as I know I haven’t been contacted. If there is any way that you could point me in the right direction on who to talk to that’d be amazing. Thank you! Hello, I have sent a couple of emails to contact@conlanpress.com for help with an item I purchased at a show. Is there a better email address to use? I haven’t heard anything for 3 weeks. I went to the Salem, MA showing but I was unable to sign up for the membership then, so I tried sending an email multiple times but never got a response back to say whether or now they had received my information. What do I do? Or will someone contact me? Hi! I went to the screening with two of my wonderful friends back in March in Tucson, AZ… That night we ordered the special edition signed books and now I’m just wondering when we should expect them to arrive? I think I remember hearing that it would take a couple months but I just wanted to make sure! Who do I need to contact about a tracking # regarding purchases made at a screening here in Texas (Richardson)? My boyfriend and I attended the show at the Laemmle Royal on Santa Monica in California on January 20, 2015 and purchased one of the special signed books that cost us $65.40 each and both of us paid with our debit cards. The guy that made the sale said that the book would be sent to us in about a month. We have never received our copies. Do you have any updates about this? I ordered a book with special illustrations years ago and STILL not received the book. I’m not happy! I still have not received my print that I purchased on Oct 1st in Rochester, MN. I have not received any emails other than my receipt of purchase… I have written on Nov 30th and Dec 17th inquiring and was told within the week. Any idea where or when my print will be sent and arrive to me? I wrote on here on November 30th inquiring about when I would receive my print that I purchased on Oct 1st when you all were here in Rochester, MN. You stated that it would be coming and I would receive an email with a tracking number. I am just following up as it is 2.5 weeks later and still have not received anything. Could you find out what happened to my print and when will I receive it? Hi! I was at your last showing in Portland at the Hollywood Theatre, and was one of the folks who put down the $50 to get the special edition graphic novel of The Last Unicorn. If you recall, it had shipped to the wrong area before the show and so we were placing the orders which would then get to us by the end of November. It’s the middle of December and I haven’t seen it arrive yet. I paid for a graphic novel at the Portland oregon show and they were supposed to be shipped to people because they didn’t arrive at the right location but it never came? Hello, I purchased a print on Oct 1st when you all were here in Rochester, MN. I was wondering how long this was suppose to take to get to me as I have not received it. I was hoping to have it by now so that I can get a frame made for it. Please let me know, I would greatly appreciate it. I special ordered one of Peter’s books since you didn’t have any copies available & was wondering if I might expect it before Christmas? Any idea how long I’ll have to wait?! Should I have received my book yet? I still haven’t seen it! Did you send me an email & tracking number yet? … I got an email from FedEx regarding a failed delivery & contacted them, only to hear it was a scam! Yikes! When you pay a company, do you expect service and goods? Or missing, hazy, and pretend delivery dates that turn into repeated series of string-along excuses… until you join the Ten Year Club? ← Connor Cochran strikes again, vexatiously targets another victim. I saw the show in May in Providence, RI, and ordered the “Bigger Better Beagle Bundle” — the two books, the DVD and a coffee table book of art from the film. I believe we had been told that the items would ship in January (and it’s still December) but I have decided to move so just emailed both contact@conlanpress.com and customersupport@conlanpress.com with my new address information. Unfortunately I didn’t have an order number (either an order confirmation was never sent or I was dumb and deleted it) but hopefully they can find it using my email address or old shipping address. I am desperately hoping that this isn’t part of the scam but since I don’t have proof of the order and haven’t heard anything from the company since I am starting to get a bit worried. Will do my best to keep this forum updated.